Here’s a second installment of “turkeys and their relatives” (order Galliformes). 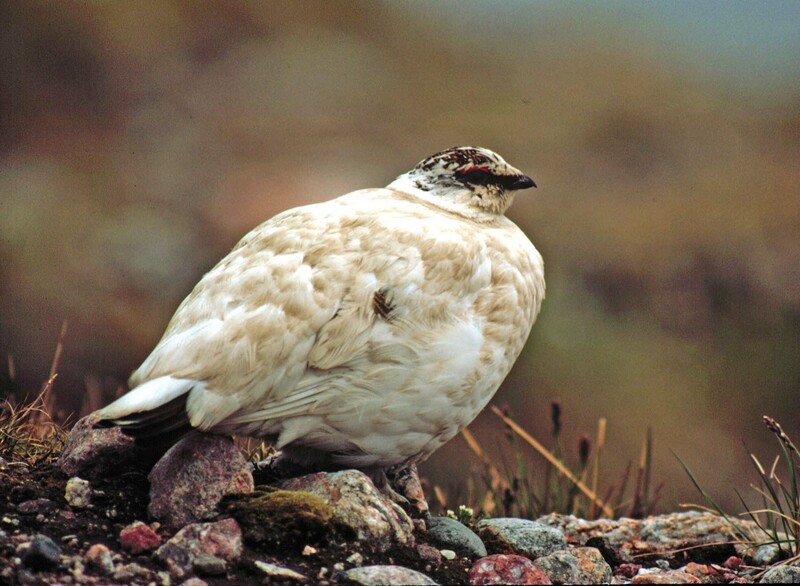 Today’s post will focus on one charismatic arctic-dwelling species, the Rock Ptarmigan (Lagopus muta). [pronounced tarmigan, the p is silent]. 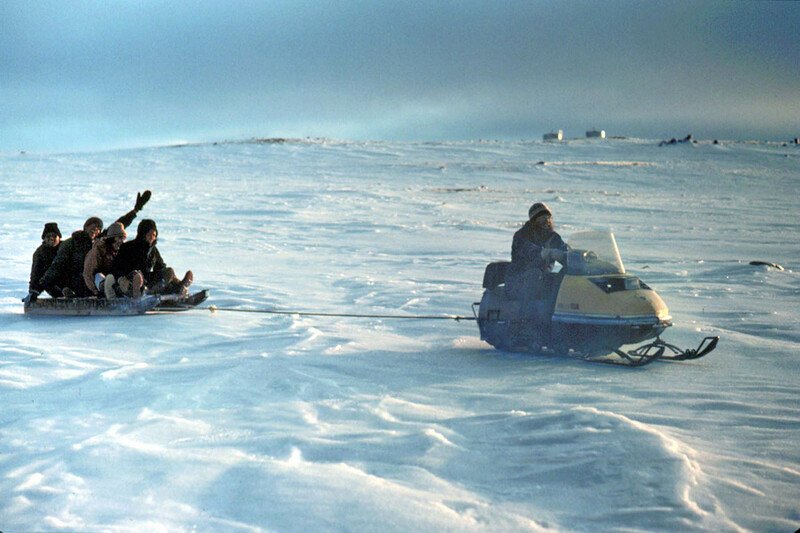 In 1981, I was lucky to help Bob Montgomerie, a professor at Queen’s University Ontario, with the first field season of his new research program on the behavioral ecology of arctic birds. 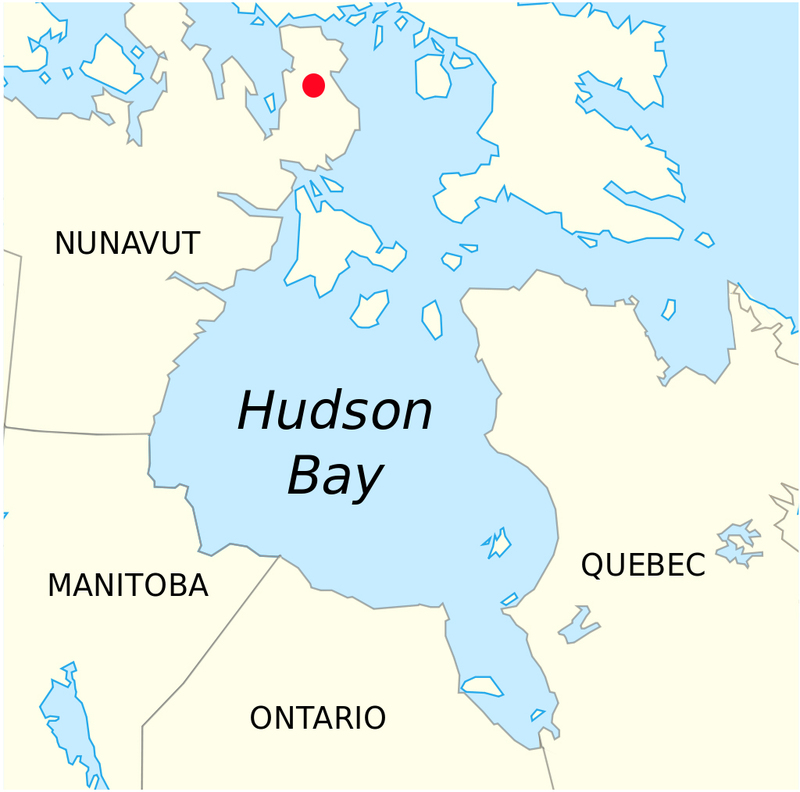 The study site was at Sarcpa Lake (red dot on map below), north of Hudson Bay and south of Baffin Island. During the Cold War, Sarcpa Lake was part of an array of a Distant Early Warning (DEW line) sites spread across the arctic to warn Canadians and Americans about imminent incineration by incoming nukes from the Soviet Union. We never got nuked and the station was eventually decommissioned and converted to a research station. Montgomerie did a 17-year study there of various arctic bird species. Rock Ptarmigan were abundant at Sarcpa Lake during our first year (populations fluctuated from year to year). They were also very tame, endearing and interesting. By way of background, there are three species of ptarmigan—one well studied species, the Willow Ptarmigan, is known to Europeans as Red Grouse. 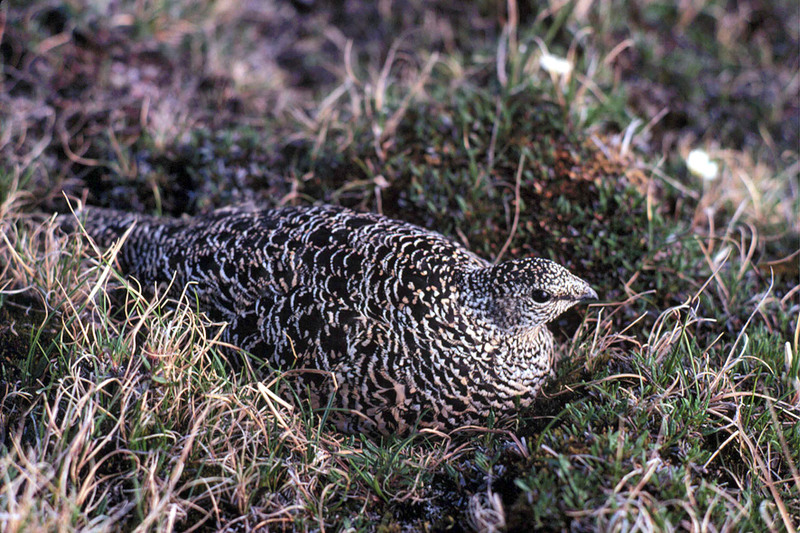 Many ptarmigan populations show the same striking regular population cycles seen in northern mammals like lemmings, hare and lynx. The population cycles of Red Grouse have been particularly well studied because these grouse are a valuable, managed game species in the UK. Populations fluctuate on a 4 to 8 year cycle. Parasitic nematode worms were long suspected of playing a role in the population cycles because population declines are often associated with high worm infestations. In a clever study, researchers were able to stop grouse populations from crashing by giving the grouse anti-worm medicine [Hudson et al. 1998 Science 282: 2256; pdf here]. This study is now a textbook example of how parasites can affect the population dynamics of their hosts. Ptarmigan have long been famous examples of camouflage—the focus of today’s post. Darwin discussed their camouflage in some detail. Ptarmigan are also unusual in having three feather molts per year (other birds have one or two molts). 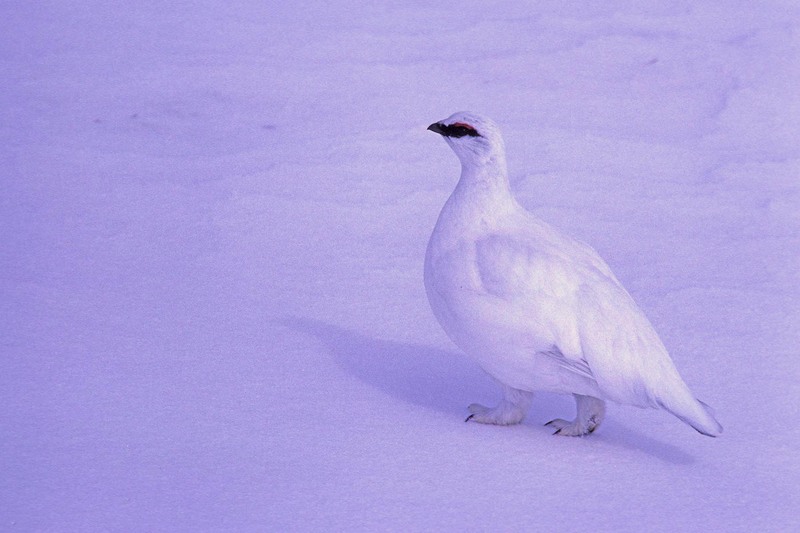 Below: In early spring, we often encountered ptarmigan walking around on the snow, still in their white winter plumage. They are very camouflaged against the snow and easy to miss. In one particularly memorable encounter, the wind had whipped the powdery snow into a sort of snow fog and a group of ptarmigan emerged ghostlike out of the snowy fog a mere ten feet from me, all but invisible. The ptarmigan at our site were also ridiculously tame; perhaps this goes hand in hand with camouflage as a defense against predators. Why flee if you are invisible? The sexes are similar in winter but by late winter large red combs above the eye indicate that a bird is a male, as the photo below shows. 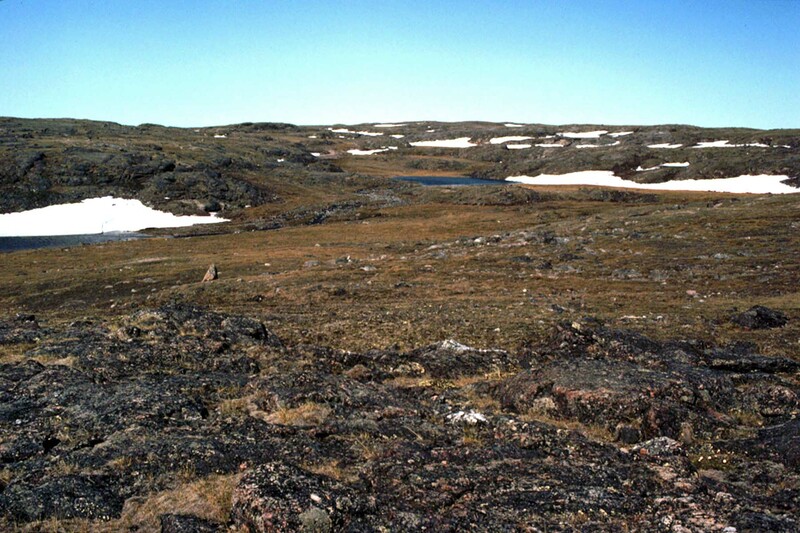 Below: Snow melt happens quickly and this is what the tundra shown above looked like three weeks later. Only females take care of the nests and eggs. Given the lack of trees and shrubs as well as the abundance of egg predators like ravens, jaegers and foxes, camouflage is critical for nesting success. 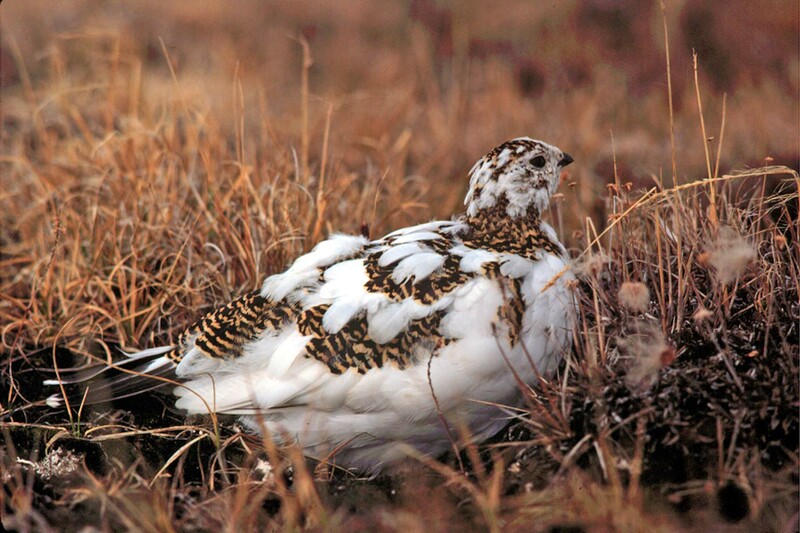 The sudden change from a white winter landscape to the dark tundra means that females have to quickly change from their white winter plumage to a breeding plumage that matches the tundra. The change seems to happen almost overnight. Below: a female ptarmigan part way through molt to her cryptic breeding plumage. 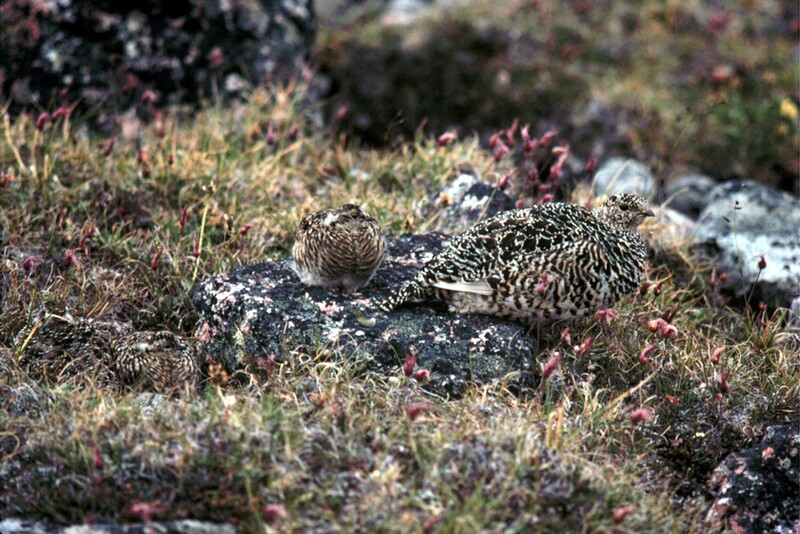 In breeding plumage, females are almost invisible against the tundra and their behavior matches this invisibility—they sit tight on the nest until almost stepped on (literally). This makes nests extremely difficult to find and we always felt lucky to find any nests. When a colleague found our first ever nest, shown below, he marked the location with a couple of piles of rocks ten feet from the nest and then brought the rest of us back to show the nest. The only problem was that he could not find the nest again—the bird seemed to have vanished. Eventually, we found the sitting bird by combing the tundra in a tight line on our hands and knees—the female was practically invisible. In the photo below, the female is much more visible because she eventually became relaxed and raised her head and I took the photo from a low angle to show her profile. When females are trying to hide, the hug the tundra with head tucked low. Because nests are so hard to find, studies that need to find lots of nests have to use dogs specifically trained to sniff out sitting ptarmigan. Below: The same nest showing the female about to sit back down on the eggs after a break from incubation to feed. 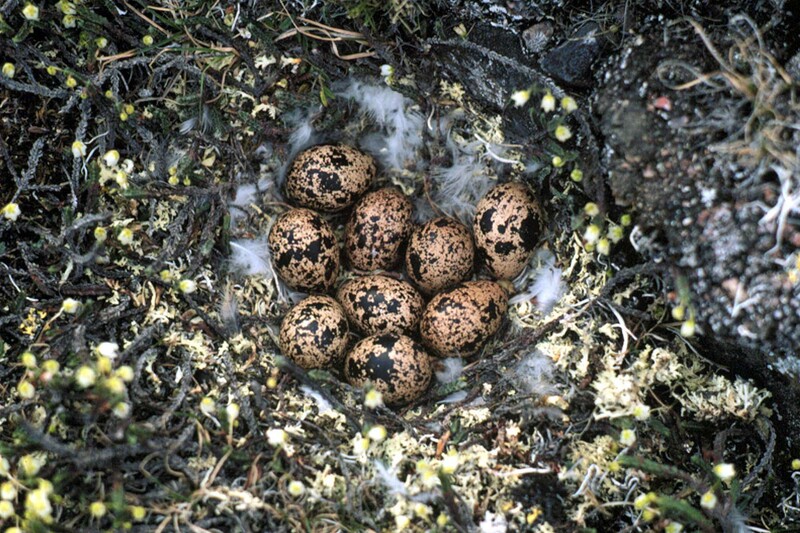 Below: A Rock Ptarmigan nest with eggs. The eggs have a feature that is unusual (unique?) for birds—the pigment remains wet and smear-able for a period after an egg is laid. The pigment can be smeared with a finger and there are reports of feather prints on eggs. It is not clear why the pigment remains wet. Below. The eggs eventually hatched and we were treated to some pretty adorable chicks. Check out the cute fluffy toes on the chick. This photo was taken with a normal lens, showing just how tame this female was. She was not only tame but also seemed completely unstressed. A stressed or concerned parent would have given an alarm call to the chicks, causing them to dive for cover under their mom. She was content to have them wandering around and crawling on her back in front of me. I guess she considered me to be like a muskox or caribou—just another big dumb animal that would hopefully not step on her. Below: Spot the ptarmigan chicks! A female with chicks a few weeks old and now in very cryptic plumage like their mom. How many kids can you spot? Below: The story for males is very different. Males defend territories to attract females. While they do not help with nesting per se, males closely attend their mates prior to the onset of incubation. Mostly this is mate guarding but it might also be serve to protect females from predators. Most males are monogamous (i.e., pair with one female) but polygyny was fairly common at our site (35% of the males had more than one mate, typically 2 females but rarely up to 4 females). In our first year at the site, Montgomerie and I were struck by the difference between the sexes in the timing of the molt—unlike females, males did not change their feathers to match the changing landscape. Instead, once the snow melted, the white males became very conspicuous against the dark tundra, as shown below. In extreme cases, we were able to spot males from a distance of 2 km. In most birds, males become conspicuous by growing colorful new breeding feathers. Ptarmigan, in contrast, become conspicuous by having the environment change, not their feathers. Note the nice fleshy red combs above the eyes on the male below. Montgomerie and his students Lynn Brodksy and Karen Holder found that comb size predicts mating success and, during fights, males go for each other’s combs to try to rip chunks out. Holder was also a coauthor on our ptarmigan plumage paper being described here. Below: The males’ behavior also increases their conspicuousness—they perch on top of boulders or perform flight displays. The flight displays are wonderful to observe—a male launches himself into the air and at the apex of the display (in extreme cases 80 m above the ground), he stalls, then parachutes back to earth with wings bowed downward, all while calling loudly in staccato burp-like calls. 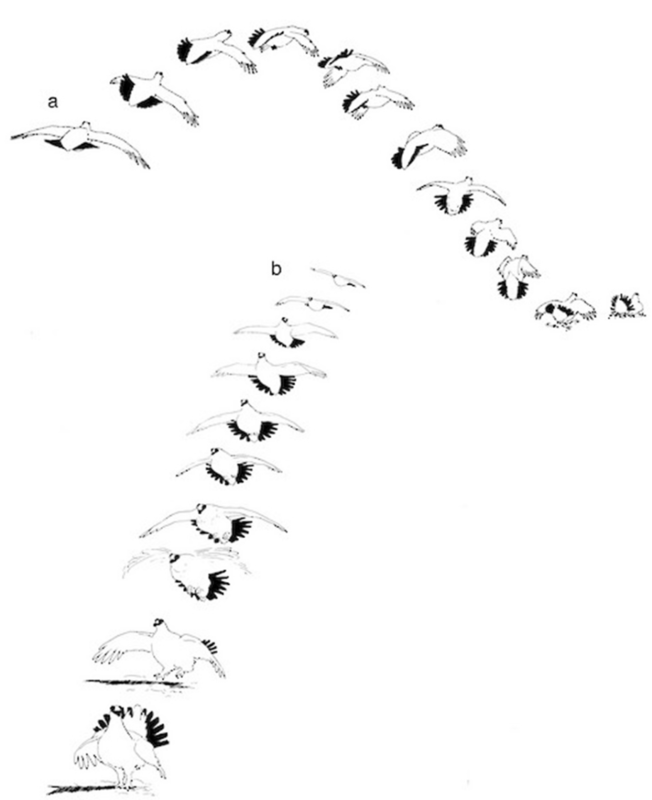 The schematic below shows the sequence of a postures during a flight display. The drawing was made by Stu Macdonald (no longer with us), a naturalist who studied High Arctic birds for the National Museum of Canada and published the first detailed description of the breeding biology of Rock Ptarmigan (in Living Bird). Below: Being so conspicuous after snowmelt likely comes at a cost for the males. Although absent at our site, Gyrfalcons (Falco rusticolus) are major ptarmigan predators across much of the arctic, often specializing on ptarmigan and eating little else. From the ptarmigan’s perspective, the risk of being taken by a gyrfalcon is sometimes extremely high, particularly for males in the breeding season when they are most conspicuous. One Iceland study found that about a third of territorial males were killed by Gyrfalcons over a two-month period in the breeding season, when the males would be most conspicuous. To put this in perspective, if this mortality rate were sustained year-round, less than ten percent of males would survive, likely the lowest survival for any adult bird. The study also found that males were taken far more than females during the breeding season, an indication that the plumage differences between the sexes affect risk of predation. 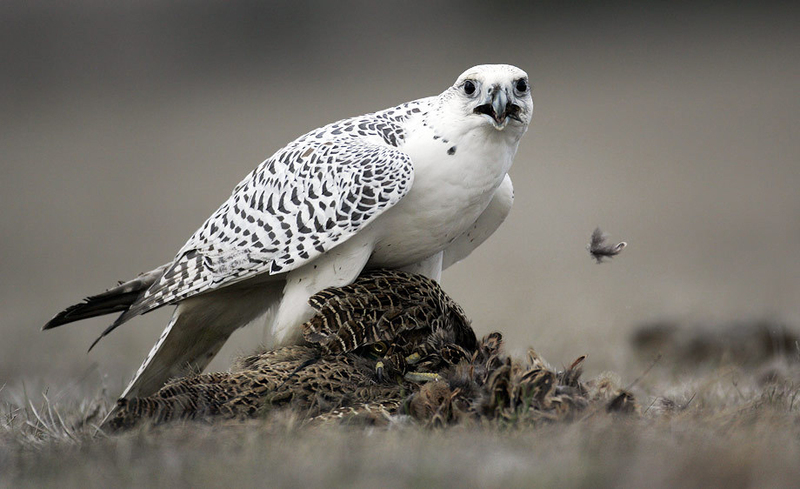 The photo below shows a gyrfalcon with a pheasant, not a ptarmigan, but the impression is similar. NOT MY PHOTO (unattributed photo from the web). Gyrfalcons are popular with falconers so I expect this was a photo with a falconry bird. The fact that males do not molt at the same time as females, and likely pay a price for being so conspicuous, got us curious about whether the conspicuousness serves a purpose (more on that in a bit). Or perhaps, males be constrained from molting—the sexual hormones needed for breeding behaviors like territory defense or flight displays might inhibit molt. Regardless, we soon discovered the males have another way of reducing their conspicuousness without molting—they get dirty. We initially noticed a few males getting dirty and did not make much of it but when it became clear that all males were getting dirty we realized that we had an intriguing pattern. Grouse love to dust bath (it seems to help with feather parasites and cleanliness) but the dirtiness we observed was not the result of dust bathing. Clean males regularly dust-bathed without soiling their plumage—getting dirty seemed deliberate. Getting dirty also greatly reduced a male’s conspicuousness, at least to human observers. We developed a ranked ‘dirt score’ to score a male’s plumage from pristine to super dirty, and we also recorded the distance at which we first saw a given male. We found that the dirtier the plumage, the closer we had to be before detecting a male, and the effect was usually striking. We suspect that dirtiness must also affect detection by gyrfalcons but have not yet tested this idea. Gyrfalcons hunt ptarmigan by spotting them from the air a great distance away and then swooping low over the tundra for a surprise attack. The photo below shows a very dirty male; he has also molted some of his head feathers. Males can reduce their conspicuousness by getting dirty but they wait to do so until well after their mates change color, and well after the snow melts. Males seem to deliberately “choose” to remain white and conspicuous. Why? To answer this question, we looked at the variation among males in their timing of dirtying. It turns out that individual males get dirty almost immediately after their mate starts laying her eggs. We could tell when females began laying eggs because a laying female seems to vanish from the tundra. Finding that males time their dirtiness to their mate’s cycle suggests that the conspicuous clean white plumage is favored by sexual selection and perhaps female preference for clean conspicuous males. We do not yet understand why females care about male cleanliness but have a couple of ideas. By remaining conspicuous, males may advertise to females their ability to avoid predation by falcons—the combination of being conspicuous and alive (not eaten) may provide an honest signal of a male’s survival skills in the face of grave risk, potentially a heritable trait. Alternatively, males might act as conspicuous beacons that deflect predation attempts away from their mate. Females might be more vulnerable to predation than males, particularly during egg-laying when they have several eggs developing at the same time, and males might benefit by deflecting the attention of predators away from their mates and having a mate that lives to reproduce. The dirtying behavior we studied occurs in most rock ptarmigan populations and many previous authors have mentioned it in passing. Interestingly, David Sibley included a drawing of a dirty ptarmigan in the first edition of his Sibley Guide to Birds (page 145) and referred to it as the ‘courtship plumage’. We suspect that Sibley had made this conclusion after consulting museum skins and noting that that this plumage occurs during the breeding season prior to summer molt. Without a detailed field study that follows the trajectories of individual color-banded males, the assumption that dirty plumage is a courtship plumage is a logical one. We wrote to Sibley and he seemed appreciative of the new information but I have not checked to see if the new edition has been updated with respect to this issue. A main finding of our study was the dirty plumage is a post courtship plumage! In case any readers are interested in more details about the study, my website has reprints of a scientific paper and an article in Natural History Magazine about the study. This entry was written by whyevolutionistrue and posted on December 19, 2018 at 8:00 am and filed under birds, photography. Bookmark the permalink. Follow any comments here with the RSS feed for this post. Both comments and trackbacks are currently closed. These are very nice to see, and interesting to read about. Related, but not really on topic, the farthest ‘into the bush’ we got on that Alaska trip with our Norwegians was maybe CHICKEN, Alaska. 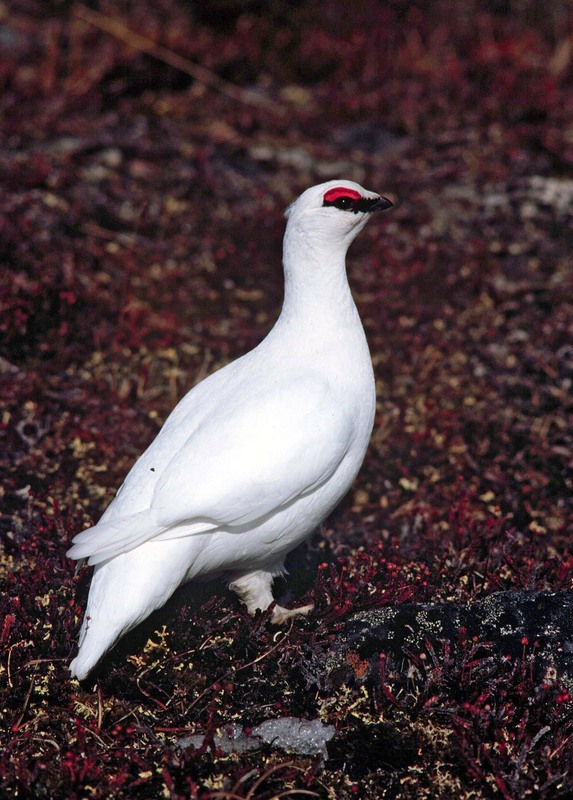 I’m wondering if anybody knows whether the rumour is true that the original settlers wanted to call it PTARMIGAN, Alaska, but the subtle spelling defeated them, hence the name changed. What an interesting and enjoyable post!! Bruce, thanks for taking the time to contribute this, and Jerry, thanks for hosting it. It’s like a nature program but for the more reading-inclined and also faster. Probably better and way more depth. Beautiful subjects, beautiful photos. What a fascinating post. Thank you so much. I am excited to read the paper on it from your website. Thanks for including that also. An absolutely fascinating account and pteriffic pictures. I was curious about the Red Grouse story, and what might cause the fluctuations of parasitic nematodes in the first place. Could it be that these parasites have a secondary host, and their fluctuations come about because of that host? Or maybe its a matter of Grouse immunity to this parasite. That is, there is an evolutionary arms race between the nematodes and the immune systems of the Grouse hosts. I was wondering the same thing and took a look at the Hudson et al. paper. 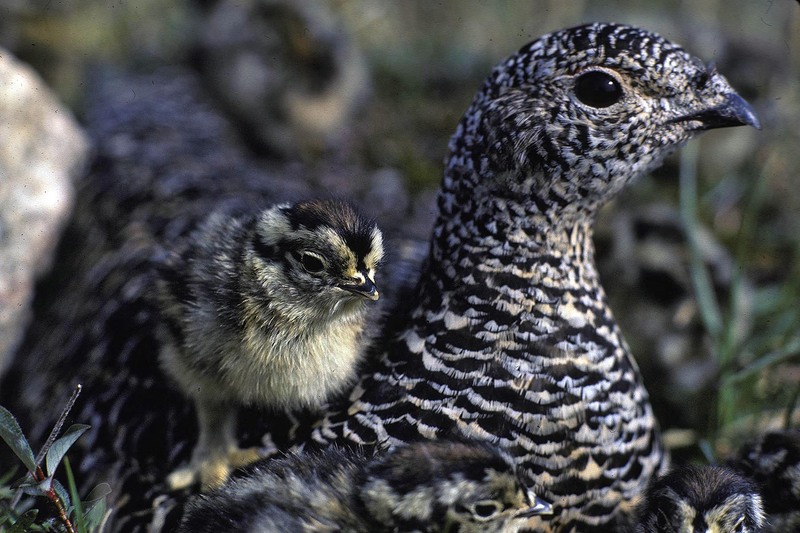 An obvious answer is that parasite transmission is ‘density-dependent’—lower transmission rates at low ptarmigan densities so that the nematodes cannot spread as well when the grouse are rare. Measels are like this. However, Hudson et al. made a mathematical model to predict how nematodes affect grouse populations and the model does a very good job of predicting the observed grouse population changes but as far as I can tell, worm transmission from host to host does not depend on grouse density. An alternative is that it takes a while for the nematodes to accumulate after a crash so that the proportion of the population infected increases over time. It would be easy to play with the Hudson model to see what is driving the worm dynamics, in theory at least. 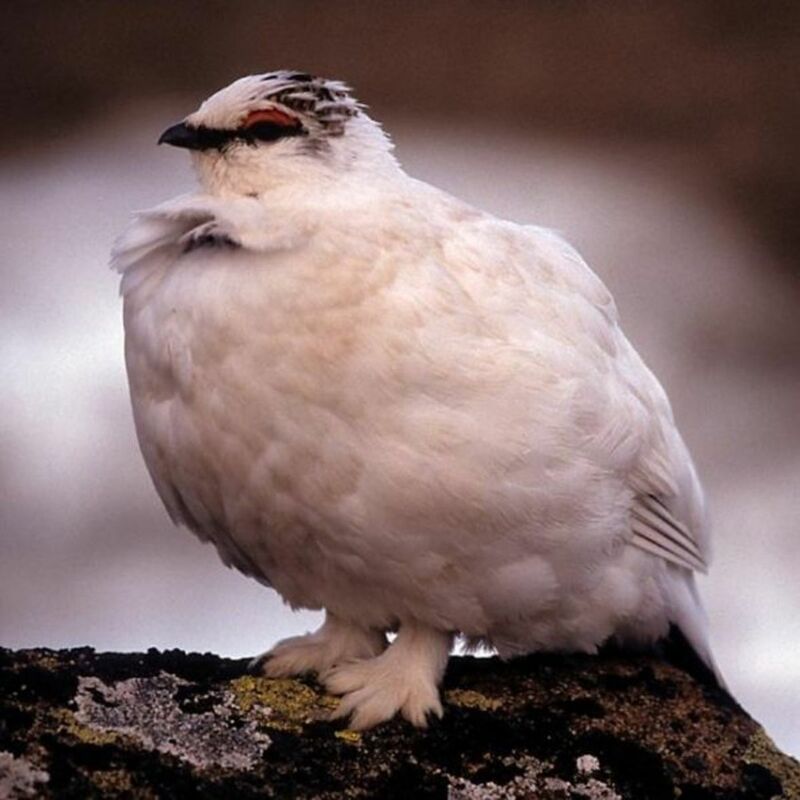 Ptotally ptaken with the pterrific Ptarmigan photos. Re; the dirty males – it does seem a frequent strategy that sexual selection puts individual males lives at risk. The huge display plumage of many birds (Birds of Paradise, Peacocks, Turkeys, etc) as well as some of the mating behaviors themselves (for example, birds that build displays – like Bower birds, or birds that spend a lot of time in open display) put themselves at greater risk of predation. In those cases though, that’s done to attract a mate. Once the mating is done I think (though I’m not sure) the plumage or courtship behavior plays no further role. In this case they’re thinking the delay in losing the white plumage may be a strategy to deflect predators from their young which is, obliviously, post mating. 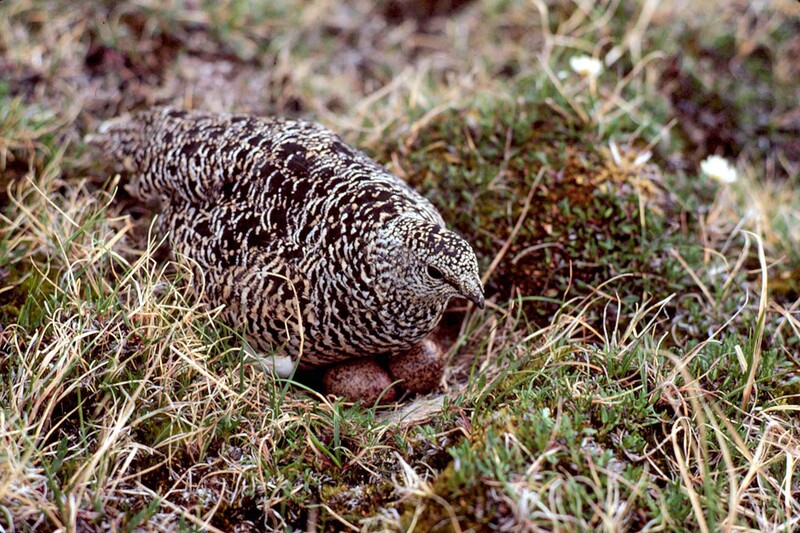 If the male ptarmigan does not invest itself in egg incubation or child rearing, it becomes adaptive for the female to choose dangerous traits for the male. It improves the survival of her chicks by focusing predation on someone else and reduces population pressure by eliminating potentially philandering males. It also ensures the passage of adaptive genes to her offspring. Why does the male consent to this dangerous phenotype? He wants to mate, of course, and natural selection has selected females that prefer white, unmolted males. Cherchez les femmes. The first part I get, but what about eliminating potentially philandering males? How can that be an adaptive advantage? I’m probably missing something, I’m mystfied there. It is adaptive for the hen and her chicks,to have dad bumped off, if dad is not participating in chick rearing. Though not obviously adaptive for the male to die prematurely, if he sacrifices his future fecundity for the success of the current brood, then he perhaps improves his inclusive fitness. Similar to the way some spiders engage in matriphagy, where the brood devours the mother after hatching. Fascinating post. Thanks for taking the time and effort to include all the interesting information. Very interesting study. I’m amused to think the conspicuous males help distract falcons from the females. Makes perfect sense, but hard to demonstrate without a Dr. Doolittle chat with the hens. I understand that many of the DEW station sites are still contaminated with PCBs. Any indication that’s doing anything? I counted 3 chicks for sure, but maybe 4. Cuties! Wonderful story, great info and pictures. Thanks so much! Wonderful stuff, Bruce (or Dr Bruce).